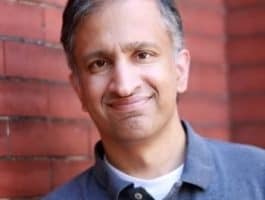 Bob: If you’re a single woman dating someone and you see evidence that he can be controlling, that he’s bit of a tyrant, Deepak Reju says that ought to be a significant red flag in your relationship. Deepak: Do not let a controlling man rule your life because right there it’s a denigration of the dignity that God gives you as an image bearer, but right there it also shows you that he doesn’t understand God’s sovereignty; he doesn’t know how to live under God’s sovereignty because he lives as if he’s king of the universe. Bob: This is FamilyLife Today for Wednesday, February 6th. Our host is Dennis Rainey, and I'm Bob Lepine. The controller guy—that’s one thing that a single woman ought to be concerned about, but there are other red flags to be aware of. We’ll talk more about those today with Deepak Reju. Stay with us. And welcome to FamilyLife Today. Thanks for joining us. I’m hoping as we’ve been having this conversation this week about single women and why smart women settle, our goal here has not been, let’s see how many single women’s toes we can step on or how many wounds we can probe, right? Dennis: No. I had a daughter who was single a good ways into her 30’s. This is real. This is a hard thing when as a young lady wanted to be married and have a family, and they find themselves in their late 20’s—the average age of getting married now is 29 for men, 27 ½ for women. This is a reality, Bob, and we just need to talk frankly and honestly. We’re doing that this week with Deepak Reju who is a pastor inside of the Beltway in Washington, D.C. at Capitol Hill Baptist Church. He’s written a book called She’s Got the Wrong Guy. As Bob hinted at a moment ago, it’s subtitled, Why Smart Women Settle. Settle--it’s really kind of a nasty word. Deepak: It is nasty word. Dennis: Here’s what I want to talk about today and I’ve got a bonus round if you cover all three of these subjects. Dennis: I want to talk about commitment. What should a woman do if there’s a guy she’s dating and he won’t pull the trigger? He won’t define the relationship. Secondly, I want you to speak to women who may have been single so long they’ve got a check list, and then third, what do you say to a 40-year-old woman who always thought she’d be married and have a family and be experiencing family in her 40’s and now she’s still single. I want you to talk about that. Dennis: --dating an angry man. It would just be quick, Bob. I know what’s in the book. Dennis: The book has got a lot of great stuff. He’s got a lot of hours with counselling. How many people have you counselled over the past, what is it, 20 years? Deepak: Yes, 17 or 18 years I’ve been counselling. I don’t know, I do hundreds, thousands. You stop counting at some point and you just start welcoming the next person that walks through the door. Dennis: What do you say to a young lady who’s dating a man who appears to be passive when it comes to making an all-in commitment called marriage? Deepak: The danger here is she actually works the relationship to force him to make a commitment. That’s just not good because we want the guy to be really clear on his commitments. Let’s take the classic example of a guy who actually works into the friendship and spends time with the girl, never defines the relationship, hangs out. Deepak: Yes, it’s organic-- [Laughter] --like vegetables. Deepak: It perpetuates because she wants to have the relationship—all her fears of getting married, her desire is to have children. Here’s a guy who’s spending time with her. only thing that’s going to cast out the fears out of her heart is you showing the love of Jesus Christ in a commitment that begins to make a safe place for her to deal with those fears and to finally experience someone who is not going to reject her if they truly get to know her. Deepak: Love is not some ambiguous feeling, but it’s commitment. God has shown His commitment to us by sending His Son for us. God has shown us what faithfulness looks like in enduring with us in all the ways that we’ve messed up. Bob: --“Jesus Christ laid down his life.” So commitment and self sacrifice are at the core of what real love is. Would you say that’s a good strategy or not? Deepak: No, in the sense of her forcing a relationship on him. Yes, in the sense of, we need to teach the guys what God looks like in His faithfulness and commitment so that they understand what it means to be a man; and not put this on women who are struggling to figure out what’s going on in the relationship. Not enough pastors or mentors are teaching men what commitment looks like and actually letting men absorb the risk in the relationship by making clear what they’re doing in the relationship by helping the gal understand, “This is exactly what I intend to do. This is exactly where we’re at. This is exactly where I’m leading us.” So the girl never has to wonder. Deepak: --then you shouldn’t be doing it. Bob: --you’re defrauding her by suggesting as you go out together and have a fun evening. In the back of her mind is, “Is this going somewhere.” If that’s to in the back of your mind, “This might be going somewhere,” then you’re being fraudulent with her. Deepak: Yes, for that single woman that’s dating the guy whose ambiguous and not clear about commitment, I’d say you need to drop him and let him grow up in his faith so that he can grow to understand what God’s faithfulness looks like / what commitment looks like in his life; so that he can maturely lead another woman forward. Deepak: Here we are in Washington, D.C., and we teach guys similar to what we’ve just been talking about: about commitment, about taking the risk on yourself, don’t leave it on her, be clear about your intentions. We’ll get guys—because Washington is filled with type A, world conquering type of people—and they will go to the other extreme of, “I’m not only initiating with you, I’m defining the terms of the relationship. I’m defining every six months exactly what we’re doing.” What we’re looking for is for a guy who just simply understands commitment and is clear with a woman about what his intentions are all along the way. He sets the precedent for what leadership in marriage will look like by demonstrating it when he’s dating a woman. Dennis: That might be a problem right there. he is studying the Word; three, he’s getting discipled; and four, he’s committed to a local church and showing that the church is important in his life.” If you have those, you have a right trajectory in a guy. Dennis: Yes, no doubt about it. The Christian life is hard work, and it takes a lifetime to truly master it in all of its disciplines. I’m not sure at the end of a lifetime you can have it mastered. Bob: You do want to have some diagnostic questions in the back of your mind but you don’t want to pull them out of your wallet on the date and say, “Can I ask you a few questions?” and see if they pass muster on that. Dennis: Or they do this online. I mean the dating online is a fascinating experience of where two older singles are kind of circling one another / kind of trying to get to know each other. There’s nothing like a person-to-person date, just to go out and have a cup of coffee / go out and have a meal together and to talk. Bob: So let me ask you this—I’ll ask both of you this because I saw this online this weekend—would you encourage a young woman to accept a date from a young man if he texted her to say, “Hey do you want to grab dinner?” or does he need to call or do it face to face. Is a text a sufficient means for a young man to initiate a date with a young woman? Deepak: We’re talking about text, we’re talking about Facebook messaging, we’re talking about all kinds of varieties of social media that initiation happens. Well, yes and no. Yes, as in, okay if he’s being deliberate; it’s not being vague. Deepak: No, in the sense of I’d rather him have walked up and said this face to face. Treat her as an image bearer with dignity. Go talk to her rather than doing the safe thing, which is just doing it through some form of electronic media. Dennis: Well, that’s what I did as a single guy. Bob: You didn’t have texting. Dennis: --in the pay phone. I didn’t go face to face. I mean dating is risky venture. Bob: You carved out a message in the stone and you passed it along. [Laughter] Hieroglyphics is what you did. Dennis: I think I’ve got a little more grace to use texting; but I hope there’s more of a context for the relationship than just that. I wouldn’t want my daughter to go out with a guy she’s never met, doesn’t know and hasn’t got enough of a relationship who would feel the freedom to text her and ask her to go on a date. Dennis: Well that feels a little slippery. Bob: It does feel a little slippery, doesn’t it? Dennis: He’s hedging his bets. Here’s the thing—did you ever get turned down? Dennis: I did, too. What about you? Dennis: Did your wife turn you down? Dennis: Let’s move on to the third question. Deepak: Yes, my heart breaks just even hearing you describe that. To that woman I want to say, don’t bear that sorrow alone. Don’t fight through your forties by yourself in the struggles that you’re going to have. Because you know on a Friday night when all your friends who got married are out doing things and you’re home by yourself, it’ll feel deeply lonely. to. That’s when you’re going to need a community who knows your burdens and who cares for you. That’s when you can’t fight through those years by yourself. It does come back to, “Is Jesus fundamentally the most important thing in your life?” As much as the desires are good, that’s a difference between what I desire and what I really need. What I need is Christ. You think of the Samaritan woman at the well in John four. Here she was, she was coming to get water from the well in the middle of the day because she’d live a shameful life. Jesus comes across and asks her for water. She’s surprised because a Jew doesn’t speak to a Samaritan, But our Lord is not bound by the cultural restraints at all. It’s interesting how she doesn’t get it, He switches the conversation to talking about all the men in her life. It’s unfair to talk to Jesus because He’s omniscient. In the conversation, He’s telling her about all the men she’s ever been with. It’s awkward for her to have that conversation. Yet He’s telling her that what she needs are not these men but Him. Again and again, Jesus shows her who she really needs. We need people to bear our pain with us. That’s hard to have gone through your 20’s and 30’s and now 40’s and not be married. Don’t do that alone. If your church is not bearing that with you, then find a church that will. Dennis: I want to turn the corner and have a lightening round. Bob: You’re really going to do this to him. Dennis: I’m really going to do this. Dennis: You’ve got to be quick on these. Let’s look at them. What do you say to a woman who’s dating a controlling man? Deepak: A controlling man is like a tyrant of a small country, and yet he’s getting it all out on his girlfriend. Yet, sometimes it’s subtle, like he actually wants to know everywhere she’s at. He’s jealous of the relationships that she has. He wants her time all the time. Sometimes it’s more explicit. Like telling her what she should wear or what she should do. Do not let a controlling man rule your life, because right there it’s a denigration of the dignity that God gives you as an image bearer. But right there it also shows you that he doesn’t understand God’s sovereignty; he doesn’t know how to live under God’s sovereignty because he lives as if he’s king of the universe. Bob: So Break it off? Deepak: Break it off. Do not let a controlling man rule your life. Dennis: Break it off now. Deepak: Break it off now. Dennis: The next one: what do you say to a woman who is dating an angry man, maybe an abusive man, maybe a man who’s abused her. Deepak: Abuse is the most horrific form of treatment of one person to another, because it’s deliberate harm, physically, emotionally, sexually to someone else. That man is worse than the controlling man, because in the control, that man is just trying to keep you under his thumb. In abuse, he’s harming you into submission. No woman deserves that. Women will make all kinds of compromises because they have fallen in love with this guy. Get rid of him. No woman deserves abuse! In fact, you should run in the exact opposite direction. All the friends who are convincing you that you shouldn’t be with this man. You should actually listen to them. Deepak: Suddenly, where this goes is women will put up with it, will get married, and will have to live under this. Then what they never imagined possible, when he hits their child for the first time, then she realizes, “I’ve got to get out.” But you don’t want to wait that long. You want to cut it off early. Dennis: What do you say to the woman who’s dating a narcissist? made himself the center of his universe and doesn’t get what it means to be a godly, Biblical man. Biblical leadership is a servant-hearted leadership modeled after what Christ did in giving up his life. A self-centered man doesn’t get that because he’s oriented his world around himself. What you see in all three of these guys--you see they’re king of the universe. They’re the center of their universe. God is not. Until they are dethroned and God is finally sitting on His throne in their life, they’re not worthy of your time. leader / a godly mentor, someone you can really trust who will tell you the truth / tell you what you need to hear, not what you want to hear in your church. Deepak: And you need to be humble enough to hear their feedback when they say things you don’t want to hear. Dennis: Well, we can’t possibly address all the issues nor speak with complete adequate wisdom to the spectrum of the single people who go all the way back into their teens / the college years / the 20’s / the 30’s, 40’s, 50’s /some who are single by choice / some who are single again, not by choice. We’re messy as human beings. What we’ve attempted to do is just advise you to the best of our ability. My encouragement is for you to get a copy of Deepak’s book, She’s Got the Wrong Guy, and to read it and maybe get some feedback soon in the relationship before you tie that knot, like Deepak warns about here. Deepak, I want to thank you for your work on this / your ministry there in D.C. May God’s favor be upon you. we’ve got in our FamilyLife Today resource center. You can order it from us today online at FamilyLifeToday.com, or call 1-800-FL-Today to order. Again the website, FamilyLifeToday.com. The number to call is 1-800-358-6329. That’s 1-800-“F” as in family, “L” as in life, and then the word, “TODAY.” Again the title of the book by Deepak Reju is She’s Got the Wrong Guy. By the way, when you come to our website you will see that our movie, Like Arrows, is now available on DVD. Also available for streaming. If you didn’t get a chance to see it when it was in theaters last year, it’s now available for you to watch together with friends or to make a movie night out of it this weekend. along and share it with a friend so that they get a chance to see the film as well. We need to say thank you to those of you who support the work of FamilyLifeToday. You help make resources like the Like Arrows movie, The Art of Parenting™ video series, all that we produce at FamilyLife designed to bring practical, Biblical help and hope to marriages and families. You make that possible through your financial support. We couldn’t do what we do without your partnership. We’re grateful to those of you who partner with us financially here. If you’d like to help with a donation today, we’d like to say thank you by sending you Crawford and Karen Loritts’s new book which is called Your Marriage Today…and Tomorrow. We’re going to be talking to Crawford and Karen about the book next week but we’d love to send you a copy today as our way of saying thank you for your ongoing partnership with this ministry. You can request your copy when you make a donation online at FamilyLifeToday.com or when you call to donate. Today…and Tomorrow by Crawford and Karen Loritts. We’re happy to send it out to you along with our thanks for your support. We hope you can join us back tomorrow when Heidi St. John’s going to be here to talk about the challenges that moms are facing in our culture today and how moms can learn to be mom-strong. We’ll talk about that tomorrow. I hope you can be with us for that.